The sharp drop in the popularity of nuclear power after the disaster at the Japanese power station, Fukushima-1, turned out to be temporary. Limiting energy consumption is not feasible not least because hydrocarbon energy resources are non-renewable natural resources. The World Nuclear Association has already made predictions that see the number of nuclear reactors in the world go up to 650 by 2032 (over 20 reactors are currently under construction in China alone and 192 nuclear power stations are in operation in 31 countries worldwide). Accordingly, as the need for nuclear fuel rises, so too does the cost. This means that the countries that have large uranium deposits may soon well find themselves turning a profit. This, however, is only provided that these countries are able to manage them properly. There are huge uranium deposits in the Central Asian region. Up to 21% of the world’s uranium reserves can be found in the Republic of Kazakhstan, which ranked first in the world for its extraction in 2009. In other Central Asian countries, there are also large deposits, but the extraction and processing of the natural resource are poorly developed. The second largest uranium deposits in Central Asia are thought to be in the Republic of Tajikistan (according to various sources, up to 13% of the world’s uranium reserves are to be found there). Currently, however, the uranium industry in Tajikistan is stagnant. In Soviet times, the Tajik SSR was a major centre for uranium extraction and the production of uranium concentrate (it was then transported to the Russian SSR for the final stage of processing to produce fuel). The Russian SSR processed ore mined in Tajikistan as well as that imported from other Soviet republics. In Tajikistan, the uranium industry was concentrated in the northern regions. 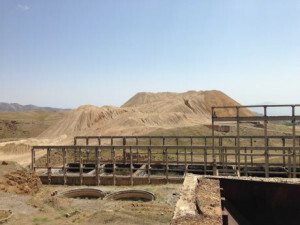 The operation of the northern mines saw their reserves depleted and in the 1980s uranium extraction and processing came to an end in Tajikistan. All that remained were the uranium waste product repositories (which accumulated over 55 million tons over half a century). In general, these repositories leave a lot to be desired: they were originally equipped without the required security measures, and after the collapse of the Soviet Union, everything ended up in a dire state. They are not guarded and they leach into the river, which leads to a high risk of radioactive contamination of large areas of land, both within and outside of Tajikistan. So it is not surprising that the Tajikistani nuclear industry is in decline. Moreover, the necessary infrastructure to develop new uranium deposits in the remote mountainous area in the south of the country is lacking and there is an urgent need to do something with the old waste repositories in the north. At the same time, Tajikistan has been suffering an energy crisis for several years now – the existing hydroelectric power stations are not able to cover the needs for electricity and there is a shortage. The population is especially hard hit in winter. However, it is too soon to start thinking about developing new deposits or resuming the production, processing and export of uranium. The only achievement that can as yet be lauded is that Tajikistan has been processing radioactive waste with Russia’s assistance since 2009. A joint Russian-Tajikistani enterprise was built on the Vostokredmet base for this purpose. Reusing waste uranium satisfies almost one third of the global demand for nuclear fuel. However, some experts maintain that in Tajikistan’s case, it is more likely to be a measure aimed at protecting the environment than a profitable enterprise, since the uranium content in the waste in local repositories is too small to be profitable. Moreover, the project was criticised by opponents who asserted that even after the extraction of uranium, these materials retain radioactivity due to other elements contained in them. As for a full recovery of the Tajikistani uranium industry, there are no predictions for developments in the near future. No geological exploration has been conducted and there are still no clear-cut plans. All this requires large initial investments. In 2008, Russian company, Rosatom, suggested that Tajikistan begin uranium extraction and even construct several nuclear power stations. Chinese companies also offered their assistance. So far, neither have had any success. It seems possible that one of the reasons for the failure was that Tajikistani law prohibits the involvement of foreign companies in the development of uranium deposits. However, China is still hoping that this legislation will be reviewed and preparations are under way to make an imminent start in developing Tajikistani deposits as soon as it is permitted. For example, Chinese companies are already engaged in the construction of roads that will link the existing Soviet-era Vostokredmet infrastructure with the new, yet-to-be-exploited uranium deposits. The nuclear ambitions of China have been mentioned above: the possibility of obtaining nuclear fuel from a neighbouring country that is also economically dependent on it (Tajikistan’s debt to China comprises approximately half of its foreign debt) is so tempting that it is willing to risk building roads there even before the Tajikistani authorities allow them to transport anything out of the country. In Autumn of 2014, Tajikistan was visited by representatives of the IAEA in order to study the data of the geological surveys in the country. It is clear that the development of nuclear energy would solve Tajikistan’s energy crisis and the export of nuclear fuel could become an important source of revenue. However, Tajikistan is unable to successfully develop these spheres independently due to a lack of resources, infrastructure and technology. Attempts made by foreign countries to participate in the development of Tajikistan’s nuclear capabilities constantly encounter an array of obstacles because the government fails to make any attempt to bring about collaboration. Some experts have already begun to question the wisdom of developing nuclear energy in Tajikistan with doubts raised regarding the quantity of uranium (those 13% of world uranium resources) that the Tajikistani government have made claims about. Consequently, the prospects of the Tajikistani nuclear power industry are very vague for the time being.